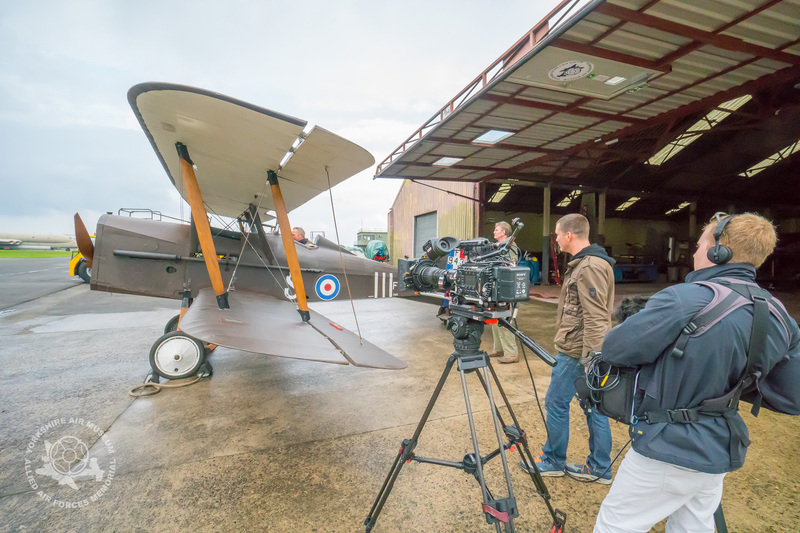 Our location in Yorkshire, coupled with our unique collection of historic aircraft, vehicles and buildings makes us a popular choice for TV programme makers. Very often, we are behind the scenes but sometimes, we are the subject of the filming. Last month, the team from Escape to the Country were with us filming a forthcoming episode all about escaping to the Yorkshire countryside. Series presenter Jules Hudson and a camera team spend most of the day with us filming the Museum and finding out more about what the Museum has to offer and some of the aircraft we have on display. Volunteer Graham Sharpe was on hand to be interviewed about the SE5a, before allowing Jules into the cockpit to try running the aircraft himself, carefully supervised of course! After a variety of camera angles, the crew moved inside to the large hangar and filmed our huge Halifax Friday the 13th, with Museum Director Ian Reed talking on camera about the history of the aircraft and the French aircrews that lived and fought in Yorkshire during World War Two. As ever when filming for TV, there’s lots of standing around as the crew set up for those all important angles, but by mid afternoon they were happy to have everything in the bag and after some refreshments they departed for home. Escape to the Country is a BBC daytime TV series where presenters take house buyers who wish to swap city dwelling for a more rural existence. In each programme they decide which part of the country they’d like to move to, then in their chosen area show them properties and places they might like to experience. While we may only be a fifteen minute drive from York City centre, our parkland grounds certainly qualify us for a countryside role. We didn’t meet the guests for this show, but it will be interesting to see Jules enjoying the propellor wash as he does his all important presenting when the show goes out, probably early in the new year. An interesting insight. Thanks for posting it.